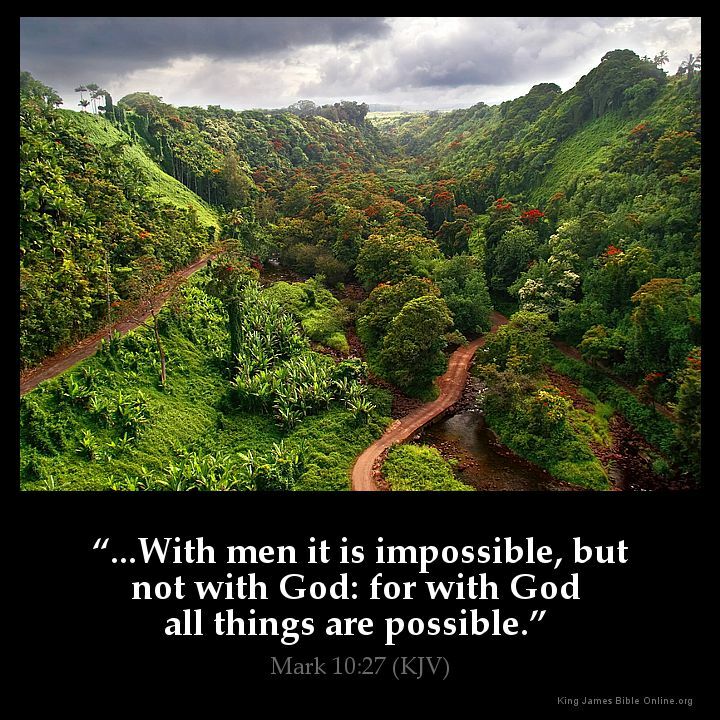 "...With men it is impossible, but not with God: for with God all things are possible." "PRAISE GOD FOREVERMORE AMEN,BLESS HIS HOLY NAME JESUS CHRIST OUR SAVIOR JESUS ALMIGHTY GOD AMEN." "All things are possible with Christ"
"All Things!! Apsolintly all things are posible! Tank U Jesus!" "Amen so true thank you God"
"AMOS ..5...4 For thus saith the Lord unto the house of Israel, Seek ye me, and ye shall live: 5 But seek not Bethel, nor enter into Gilgal, and pass not to Beersheba: for Gilgal shall surely go into captivity, and Bethel shall come to nought. 6 Seek the Lord, and ye shall live; lest he break out like fire in the house of Joseph, and devour it, and there be none to quench it in Bethel. 7 Ye who turn judgment to wormwood, and leave off righteousness in the earth, 8 Seek him that maketh the seven stars and Orion, and turneth the shadow of death into the morning, and maketh the day dark with night: that calleth for the waters of the sea, and poureth them out upon the face of the earth: The Lord is his name: 9 That strengtheneth the spoiled against the strong, so that the spoiled shall come against the fortress. 10 They hate him that rebuketh in the gate, and they abhor him that speaketh uprightly. 11 Forasmuch therefore as your treading is upon the poor, and ye take from him burdens of wheat: ye have built houses of hewn stone, but ye shall not dwell in them; ye have planted pleasant vineyards, but ye shall not drink wine of them. 12 For I know your manifold transgressions and your mighty sins: they afflict the just, they take a bribe, and they turn aside the poor in the gate from their right. 13 Therefore the prudent shall keep silence in that time; for it is an evil time. 14 Seek good, and not evil, that ye may live: and so the Lord, the God of hosts, shall be with you, as ye have spoken. 15 Hate the evil, and love the good, and establish judgment in the gate: it may be that the Lord God of hosts will be gracious unto the remnant of Joseph. 16 Therefore the Lord, the God of hosts, the Lord, saith thus; Wailing shall be in all streets; and they shall say in all the highways, Alas! alas! and they shall call the husbandman to mourning, and such as are skilful of lamentation to wailing. 17 And in all vineyards shall be wailing: for I will pass through thee, saith the Lord. 18 Woe unto you that desire the day of the Lord! to what end is it for you? the day of the Lord is darkness, and not light. 19 As if a man did flee from a lion, and a bear met him; or went into the house, and leaned his hand on the wall, and a serpent bit him. 20 Shall not the day of the Lord be darkness, and not light? even very dark, and no brightness in it? 21 I hate, I despise your feast days, and I will not smell in your solemn assemblies. 22 Though ye offer me burnt offerings and your meat offerings, I will not accept them: neither will I regard the peace offerings of your fat beasts. 23 Take thou away from me the noise of thy songs; for I will not hear the melody of thy viols. 24 But let judgment run down as waters, and righteousness as a mighty stream. 25 Have ye offered unto me sacrifices and offerings in the wilderness forty years, O house of Israel? 26 But ye have borne the tabernacle of your Moloch and Chiun your images, the star of your god, which ye made to yourselves. 27 Therefore will I cause you to go into captivity beyond Damascus, saith the Lord, whose name is The God of hosts." "Because he knows what the wise did not know.Thousand years is a day in his face so lets have faith in the LORD JESUS AMEN." "I BELIEVE THAT GOD'S WORD, AND HIS WORD MUST SURELY COME TO PASS"
"I like it. The word is clear, it says "all things", not some but surprisingly many people believe there are some things which are imposible. Thats wrong troi oppose God." "Laurie Williams Rose Keep the faith. Prayers will be answered." "Mar 10:26-27 " And they were astonished out of measure, saying among themselves, Who then can be saved? 27 And Jesus looking upon them saith, With men it is impossible, but not with God: for with God all things are possible."" "One of my favorite verses!! ;-)"
"Tank u God,i knw wit u it is possible in my life"
"Up with the Early Morning Rain and so THANKFUL that our God is absolutely LIMITLESS." What Do You Think of Mark 10?